Joshua tree is one of America’s 58 national parks and despite it being such a large part of my childhood I had never brought Kahana here in the 15 years we’ve been together. Most people avoid Joshua Tree during the summer, but I grew up loving the heat and figured that 4th of July weekend was as good a time to visit as any. 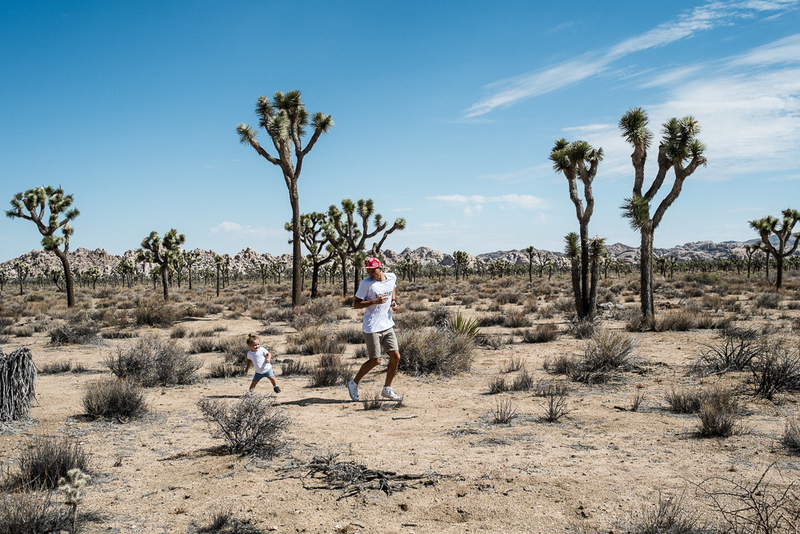 Joshua Tree National Park is a surprisingly family friendly park. Known for its huge rock formations, natural oases, cactus gardens, desert wildlife, dark skies and bright stars. There are paved roads to most of the park’s attractions making it easy to visit with the kids. There are multiple .5 - 1.5 mile hikes, and some are even stroller friendly. If you feel like camping there are also 9 campgrounds throughout the park and most are equipped with water and public restrooms. There are lots of ways to experience Joshua Tree but with the two kids we decided to turn it into a half a day trip. We woke up early to try to beat the heat. We entered the park at the 29 palms entrance conveniently located near the 29 Palms Inn where we were staying. We stopped at Jumbo Rocks and hiked around a bit. Duke loved climbing the boulders and playing in the cave formations while Coco pretty much just slept in my ergo. After an hour or so of that we jumped back in the car to cool down in the AC and roam throughout the park. Every so often we’d pull over and get out to take in the vastness of the sea of Joshua Trees. We drove up to Keys View that overlooks the Coachella Valley. The air was pretty clear so we could see all the way from Palm Springs to the North Shore of the Salton Sea. From there we loaded back in the car and followed the road to exit out of the west entrance of the park grabbed lunch at The Crossroads Cafe (which we highly recommend) and headed back to the inn. If you do plan to visit be sure to bring lots of water, sunscreen and snacks for the kids. If you are allergic to bees I’d highly recommend bringing your epi pen. There can be a lot of bees in the park that are attracted to the moisture of your car once you park. Park hours: Open 24 hours a day.